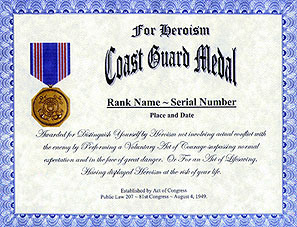 An unaltered photocopy of your DD-214 or other military issued document clearly displaying your award of the Coast Guard Medal. Contact The War Library if you do not have a DD-214 or other military issued documentation authorizing your award: 1-562-422-4100 (Pacific Time Zone). Authorized in 1951, but not produced until 1958, it is awarded to any person serving in any capacity with the Coast Guard who shall distinguish himself by heroism not involving actual conflict with the enemy. The individual must have performed a voluntary act of courage surpassing normal expectation and in the face of great danger. For an act of lifesaving, the individual must have displayed heroism at the risk of his life. The Coast Guard Medal was established by Act of Congress (Public Law 207, 81st Congress) on August 4, 1949. The Coast Guard Medal has been in effect since August 4, 1949. The Coast Guard Medal is awarded to any member of the Armed Forces who, while serving in any capacity with the Coast Guard, distinguishes himself or herself by heroism not involving actual conflict with an enemy. To justify this decoration, the individual must have performed a voluntary act of heroism in the face of great personal danger of such a magnitude that it stands out distinctly above normal expectations. The Coast Guard Medal is worn after the Distinguished Flying Cross and before the Gold Lifesaving Medal. Additional awards of the Coast Guard Medal are denoted by Gold Stars. The Coast Guard Medal was designed and sculpted by Thomas Hudson Jones (1892-1969) of the Army's Institute of Heraldry. The first Coast Guard Medals were awarded to Engineman Third Class Earl A. Leyda and Boatswain's Mate third Class Raymond A. Johnson in June of 1958. The Seal of the United States Coast Guard appears in the center of a bronze octagon. The Seal is contained within a border of continuous cable. The octagon shape was adopted from the shape used by the Soldier's Medal and the Navy and Marine Corps Medal, and the Seal in the center refers to Coast Guard service. 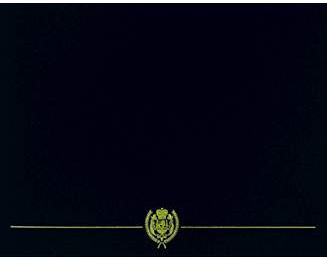 The border of continuous cable refers to both naval service and perfection of ideals in the service of man. In raised letters, the inscription FOR HEROISM with space for engraving the recipient's name. Central and edge stripes of light blue; and centered on either half of the ribbon a field of white containing three red stripes. The colors of the ribbon were adapted from those of the Coast Guard Seal.